This month there are several contemporary novels coming to the shelves. Here are two you might want to grab. Both are available for pre-order or you can look for them on July 23rd. 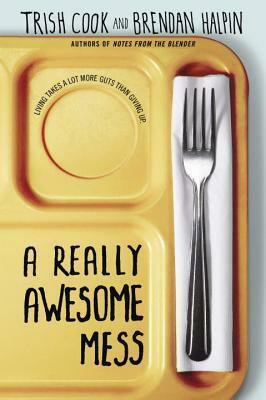 My Thoughts: Lately there have been more and more co-authored books appearing on the young adult scene. It’s a trend that I appreciate. In A Really Awesome Mess, Trish Cook and Brendan Halpin have worked together to bring us two distinct and intriguing voices. The chapters alternate between an angry Emmy and the roller coaster ride that is Justin. There are some pretty intense issues that the characters are dealing with, but the authors have light hands. They also keep a lot hidden in the beginning so things snuck up on me to be honest. Little by little, I discovered what difficult issues Justin and Emma are working through. But just when I thought things were grim and overwhelming — pigs entered the picture. Seriously. A Really Awesome Mess is like that. Seemingly random bizarreness. That’s what made me smile. Also, the friends Emmy and Justin gather have unique personalities that help the story sparkle. While not everything is plausible, Cook and Halpin manage to provide many laughs in spite of the tough subject matter. If you like issue books with a large dose of humor, you will want to get this one soon. My thoughts: There was plenty to laugh at here. Vee gets himself into complicated and humorous situations over and over again. He makes choices that are cringe-worthy throughout the book. This, of course, is part of the charm. The reader is compelled to find out if Vee is truly going to go through with his next idea. Then, there is the wait for the train wreck that is sure to happen. The book is fairly lighthearted and entertaining most of the time. Vee is trying to figure out who he is and what he wants for himself so it isn’t only about the laughs. I was uncomfortable with some of the terms that Vee used like retarded and lesbos, but these are certainly words that are tossed about in high schools and they fit the context. They were just a little jarring for me. I also found the speech patterns for Vee’s father a little stilted. He often sounds formal and maybe the purpose was to show that English wasn’t his first language or to emphasize how closed off he is to Vee, but it seemed awkward to me. 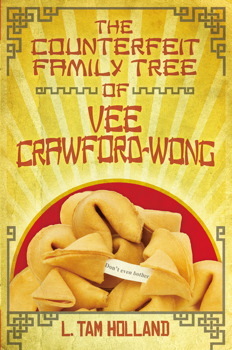 You will find humor, a bit of romance around the edges, basketball action, and plenty of high school and family drama in The Counterfeit Family Tree of Vee Crawford-Wong. If humorous contemporary books are your thing, get it soon. L. Tam Holland did a reading of her book last week if you want a sneak peek.